Current events worldwide seem surreal when one looks around our area and observes rural agricultural lands, immense clean lakes, forests, fields and parks etc. Our cultural and natural resources are incredibly numerous, yet there are threats of all types. The 2015 Annual Research Conference of the Finger Lakes Institute at Hobart and William Smith Colleges focused upon regional environmental threats. On November 12, scientists and researchers gathered from across NY to share current findings and project successes and difficulties. A student poster session offered an opportunity to view recent research and speak with the researchers. Ranging from domestic landscaping plant surveys to data collected by FLI’s Watercraft Steward Program, it was rewarding to see so much work being done to ascertain the health of our environment and the potential impacts of our behaviors. The atmosphere of collaboration and active study offers much promise for the area. Reports of mercury contamination and round gobies were offset by a positive report concerning hydrilla in Cayuga Lake. Identification of hydrilla in Tinker Pond in Henrietta prompted a little head-scratching. This small body of water is quite land locked. This has been a month of travel and will be for many over the upcoming holiday week. Enjoy family, friends, safe travels and the outdoors. Below are a few recent photographs of the beauty all around us. A faint rainbow arks into the clouds from a rosy horizon on the eastern ridge of Cayuga Lake. 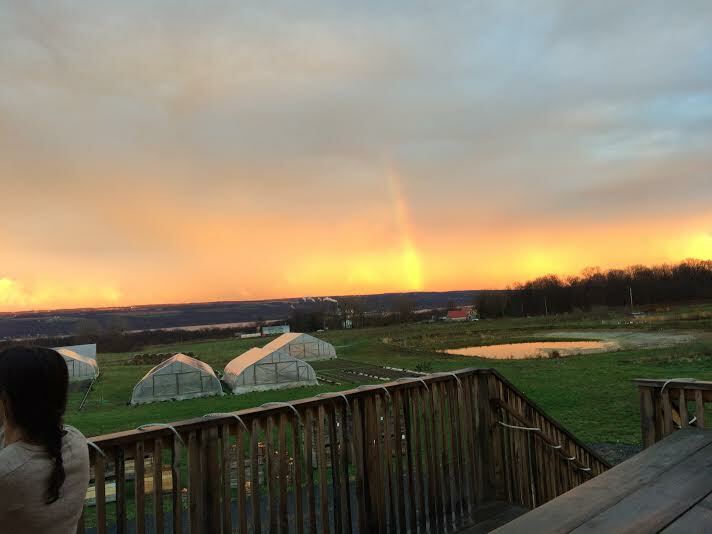 Photo captured at the Finger Lakes Cider House by Kristen Moore. 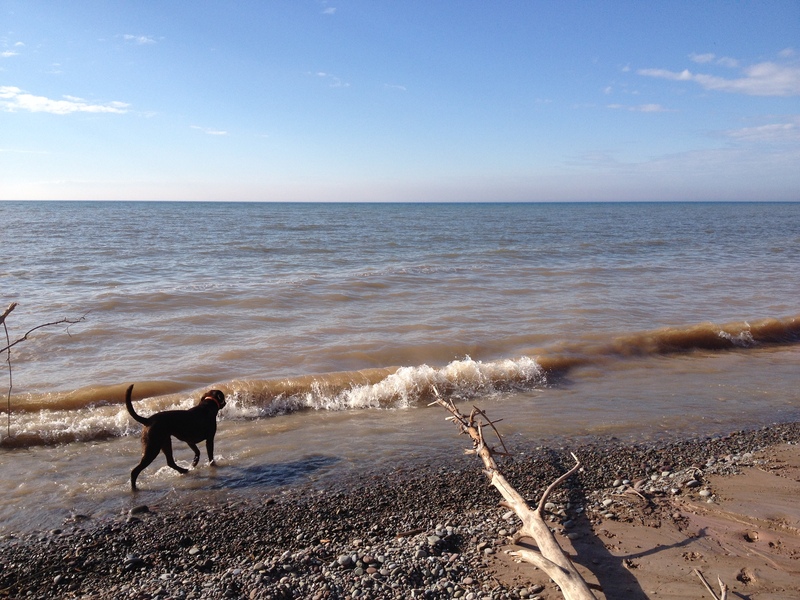 Beloved brown dog walking through shallow waters along shore of Lake Ontario. 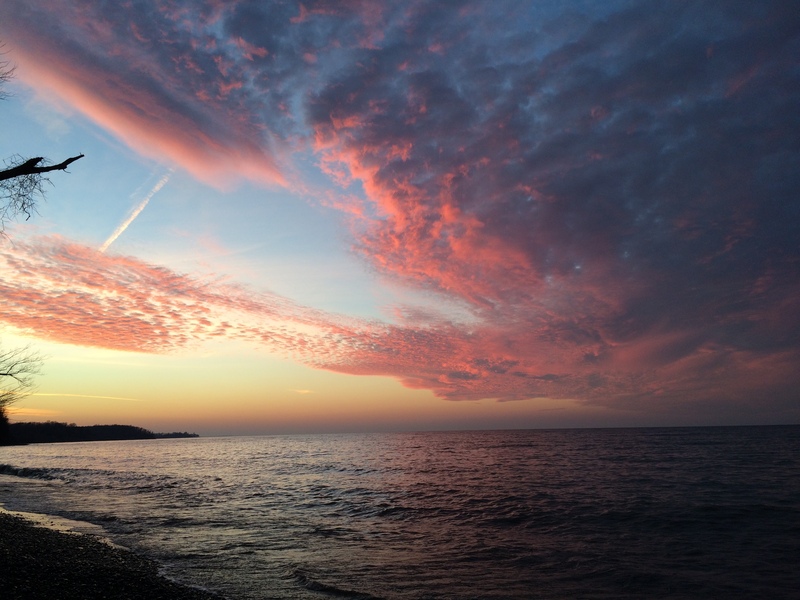 Pink skies and waters create stunning scenery over Lake Ontario in Huron, NY.